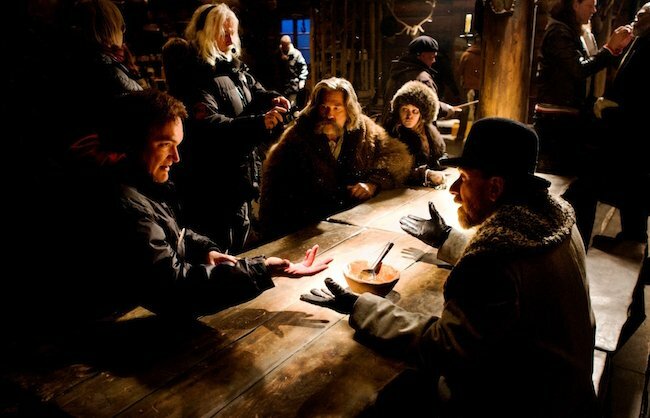 When Quentin Tarantino announced that he was going to film The Hateful Eight in Ultra Panavision, a format last used in 1966, words like “ill-considered” and “insane” were not uncommon reactions from the film industry and cinema enthusiasts. 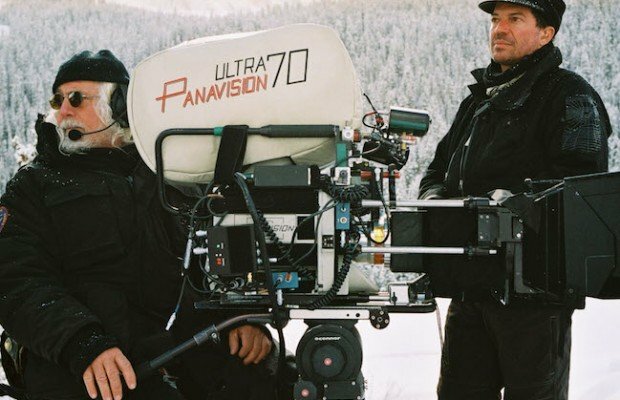 Although Paul Thomas Anderson had revived interest in 70mm filmmaking with The Master in 2012, Ultra Panavision was another beast entirely. While there was still a limited infrastructure for 70mm filmmaking and projecting, the infrastructure for filming, let alone projecting Ultra Panavision, which is shot on 65mm film and projected as 70mm, was deeply—and many thought permanently— dormant. Sure, the format is pretty. It’s often described in breathless terms. What did it take to attain such aesthetic heights? The story of The Hateful Eight is the story of restoring an infrastructure that, as David Kornfeld, head projectionist at Massachusetts’ Somerville Theatre, points out, was systematically destroyed—labs, projectors, theaters, projectionists—by an industry that “didn’t care about the experience of seeing a film.” Maybe that indifference is beginning to melt. Tarantino’s concept was audacious, and the screening plan went through a number of permutations. 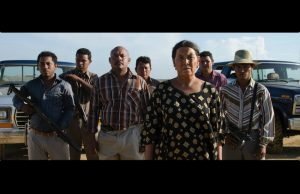 Distributor The Weinstein Company’s screening plan has been fluid, sometimes to the frustration of theaters. At one point, there was to be a two-week exclusive run of the film for 70mm Ultra Panavision-equipped theaters, before a subsequent digital release. But then that exclusive window was halved to a week, with the 70mm run starting on December 25, and the digital release the first week of January, 2016. The film will also be screened in 35mm at some venues. To produce its aspect ratio of 2.76:1, Ultra Panavision requires anamorphic lenses for the camera to squeeze a wide image onto 65mm film. An anamorphic lens is then used to de-squeeze the image during projection. The unusual-looking lenses employ prisms to alleviate the distortion that plagued competing wide formats. The image was designed to fill the epically wide screens of the ’50s, an era when the industry was searching for ways to retain audience share in the face of television. 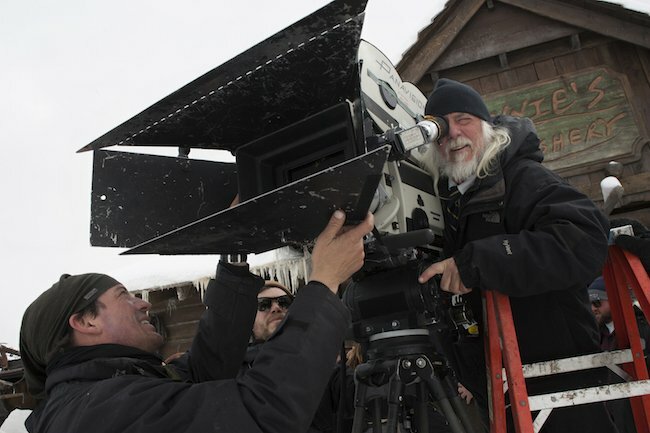 During preliminary discussions about the film with Panavision, cinematographer and longtime Tarantino collaborator Robert Richardson took notice of Panavision’s collection of Ultra Panavision lenses. The idea took root. It wasn’t a direction Panavision was expecting. The first step was to take a look at the state of lenses that had been used as far back as Raintree County (1957) and Ben-Hur (1959). To get the lenses into shape for modern moviemaking, says Roudebush, lenses needed to be rebuilt to be useable with modern cameras, while keeping the all-important original glass. The Panavision team ran into some surprises along the way, including booby traps designed back in the day to prevent tampering with the company’s proprietary lens technology. 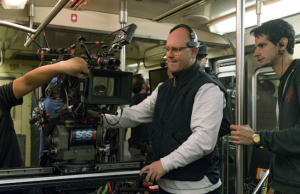 Lenses weren’t the only part of the project that Panavision took on. The company also supplemented existing 1,000-foot magazines with new 2,000-foot magazines for long Tarantino takes. 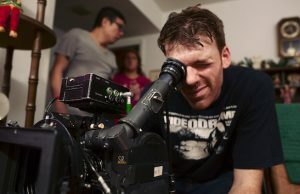 While Richardson and Tarantino were working on lens and camera details with Panavision, projection experts were tackling the screening challenge. To help meet Tarantino’s roadshow goal of 100 theaters, The Weinstein Company turned to Boston Light & Sound (BL&S), which has deep experience in meeting projection challenges. The minor recent revival of 70mm film events in certain metropolitan areas hasn’t come as a surprise to Chapin Cutler, BL&S co-founder. In fact, he earned a steak dinner over a bet about the likelihood of a 70mm premiere a couple of years ago, when The Master opened. However, the rebirth of Ultra Panavision was a surprise. 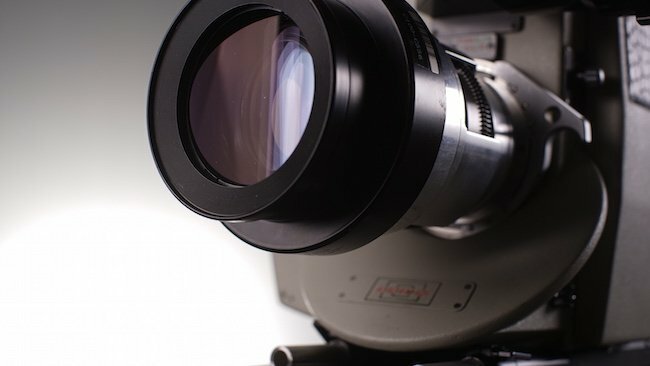 Develop safeguards and training guidelines for projectionists unfamiliar with 70mm. The Ultra Panavision screenings would take place in two venue types: a handful of theaters (such as the Music Box in Chicago, the Hollywood in Portland, and the Somerville Theatre) already equipped for and experienced in screening 70mm films; and the more numerous pop-up venues that would require installation of projection equipment prepared by BL&S. The gear-up for the existing theaters was far simpler. These theaters needed Panavision anamorphic lenses, test loops and some support from BL&S. 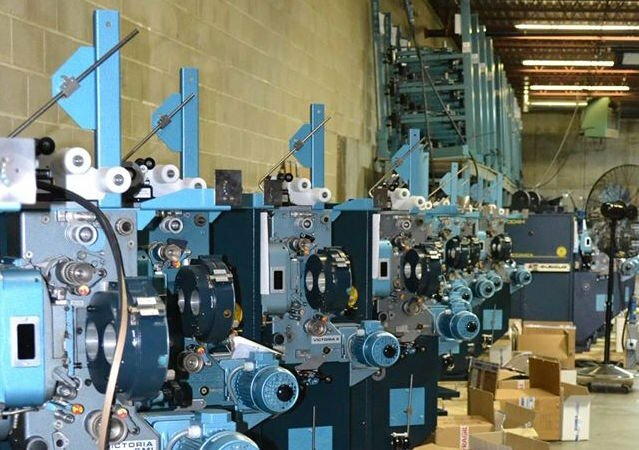 They would employ traditional, two-projector changeover systems, with multiple reels. There were still loose ends to tie up, though, such as altering screen masking to accommodate the aspect ratio, or custom work to make the anamorphic lenses marry up with projectors and prime lenses, in the case of the Hollywood. For the vast majority of theaters, which lacked the ability to show the 70mm film, projectors needed to be installed. To keep things simple, these theaters would get single projectors and use a platter system to avoid changeovers and splices. Cutler went on a projector buying spree, scouring numerous sources across the nation, including cinema dealers and service companies. Some projectors came from theaters where they had been abandoned in booths; others had been ripped out of soon-to-be destroyed venues. The work didn’t end when the projectors arrived at BL&S. They were in various states of disrepair, and, in some cases, the company needed to fabricate key missing parts. In addition, BL&S needed to procure 35mm platters, which then needed to be customized for the 70mm film. Securing the projection lenses was another challenge. The few vintage lenses in existence were designed for long-gone, longer projection-throw movie palaces (i.e. with long distances between projector and screen). The lenses would not work in the confines of modern theaters that needed lenses with shorter throws. Some projection lenses were built from scratch, and others were created by modifying modern lenses. Following the run of The Hateful Eight, Cutler says the plan is for the projectors and lenses to be checked over and carefully stored—meaning that the heavy lifting of projector and lens acquisition will have been done for other possible roadshows. BL&S was also tasked with helping to set up the human side of the screenings: the training of projectionists. Experienced projectionists are quick to note that screening 70mm is a craft that takes time to develop—and experienced 70mm projectionists are now few and far between. The Somerville’s Kornfeld has been skeptical about neophyte road-show projectionists tackling the format at the pop-up theaters. “Shooting in Ultra Panavision was ill-considered,” he says, in terms of the sheer impracticality of the endeavor. He points to problems with early New York and Los Angeles screenings, although he notes that many other screenings have played without a hitch. Among his concerns for the roadshow screenings are scored prints and, worse yet, platter catastrophes, where an entire print can be destroyed if something goes amiss. In order to minimize opportunities for human error, BL&S worked hard to keep things simple for less-experienced projectionists. For example: leaders and rollers were color-coded to ensure correct threading; shipped film was already set up on platters, negating the need for splicing; training materials were created to detail processes; and unneeded projector components were removed (and safely stored by BL&S) to keep the projectors as simple as possible. BL&S also provided on-site assistance. So, after all that effort, how does The Hateful Eight look on the screen? The picture quality has surprised seasoned veterans. While much of the talk about the format’s beauty is on aspect ratio, vintage glass and negative size, many forget that today’s film stock far outclasses that of the ’50s. Venerable Kodak played a key roll in the project, gearing up to meet the needs of the film by providing four Kodak VISION3 stocks of 65mm film. Kodak also manufactured the VISION3 5219 stock in longer 1,800-foot rolls (compared to the usual 1,000-foot rolls) in order to accommodate the long dialogue scenes of Tarantino’s script. That equated to 16 minutes per take for Richardson (the 1,000-foot rolls clock in just under nine minutes), says Andrew Evenski, Kodak’s president of entertainment and commercial films. The only place to really see an Ultra Panavision film, everyone agrees, is on the widest possible screen. Quite simply, the format is designed for width. 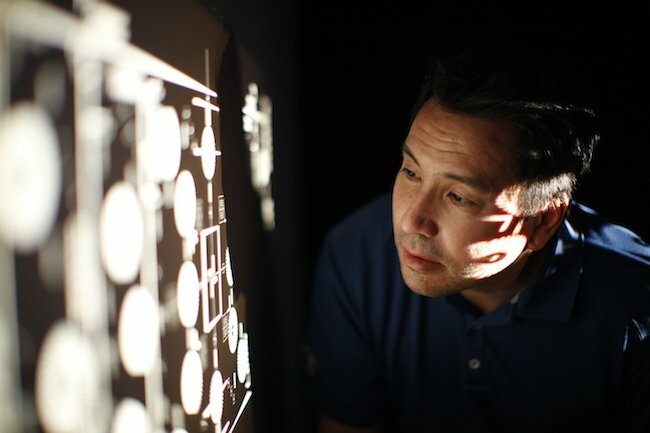 Julian Antos, technical director and projectionist for Chicago’s Music Box, who became a believer in large-format moviemaking after seeing The Master, says that he understands the value of seeing the film properly. The Music Box, which was built in 1929, is doing its wide-screen best by installing a temporary 40-foot screen for the film. Construction started at 6 p.m. on December 24 to be ready for the Christmas Day opening. So was it all worth it? The consensus seems bullish. Theatrical screenings netted mostly positive reviews, with reports of glorious projection despite a litany of hiccups. The film opened at $56,000 per screen, prompting an expansion of the digital release to 1,958 screenings before 2015 closed. Portland’s Hollywood Theatre, for one, saw box-office profits from opening weekend at five times the theater’s previous record. To understand how esoteric the ultra-wide format is, consider that only 11 films have ever been filmed in Ultra Panavision—the first in 1957, the last in 1966 prior to The Hateful Eight. This article appears in MovieMaker‘s Winter 2016 issue.